Pioneers in the industry, we offer Filling Machines such as High speed tin filling machine and Tin filling Machine from India. We are reckoned manufacturer, exporter and supplier of Powder filling machine that is used for filling detergent powder, coffee powder, skimmed milk powder and spices. The offered filling machine is made up of quality tested components and cutting edge technology in adherence with industry norms. 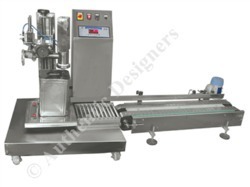 We have quality experts who test this filling machine so as to ensure its quality. 10 grams- 100 grams. 20 packs per min. 1-3 grams. 1kg. -3 kg-5 kg. 6-10 packs per min. 5-10 grams. Packing Material Jars, Bottles, Cans etc. Power 2.5 kW, 415 Volt, 3 Phase, 50 Hz. AC. Quantity 1 to 2 & 5 Kg. Machine Hopper Capacity 50 Kg. The semi-automatic weighs metric machine with the electronic load cell based system is used for packing granular and free-flowing products in a wide range of consumer pack with highly accurate weighing system ensuring high speed and easy changeover. load cell controlled weighing system which ensures highly efficient weighing easy calibration and weighing system thus reducing weighing changeover time. the pneumatic technology used for easy and efficient working of the machine. An automatic Weighing filling system with Process Controller. Bulk & fine Feeding by mode of a variable drive system. With the help of the experienced engineers, we have been able to design and develop Pouch Filling Machine. 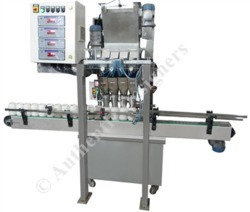 This machine is used for filling of liquid products in a wide range of consumer packs with highly accurate weigh-metric based filling system, ensuring high speed and easy changeover. All liquid products as oils, shampoo, adhesives, medicines, pesticides, ghee, milk etc. Weigh-metric based filling system with digital display of weight setting. Easy filling quantity setting through display panel thus reducing weighing changeover time. No setting required for change of bulk density of the product. 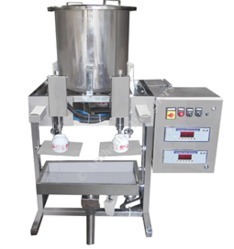 Owing to our sturdy market presence we proudly offer our product Automatic Rotary Curd Filling Machine. Application: Ghee, Milk , Curd, Oil, chemical etc. Feature: It is use for filling.